The event is being held as part of the EMPOWA project which is being carried out by EKT and targets organisations and bodies that support women entrepreneurs in high tech and innovation. 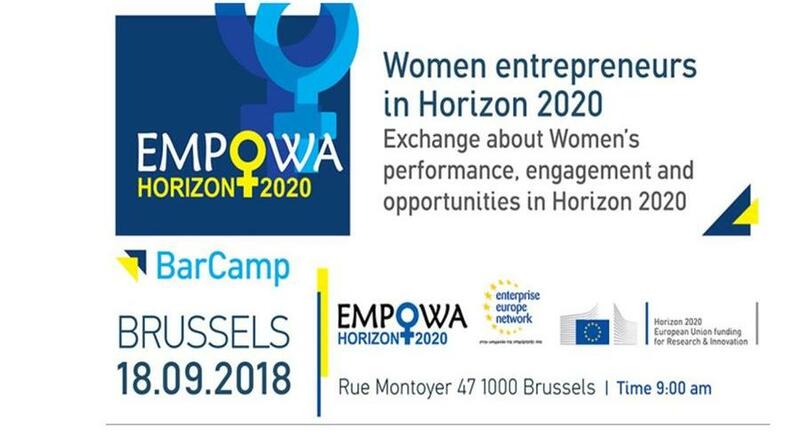 The European EMPOWA BarCamp event 'Women entrepreneurs in Horizon 2020 and beyond' will be held on 18 September in Brussels. The goal of the event is the exchange of opinions, experiences and suggestions about women’s performance, engagement and opportunities in Horizon 2020 and beyond. The National Documentation Centre (EKT), co-ordinator of the EMPOWA project and Enterprise Europe Network-Hellas, is supporting the participation of Greek organisations for women high-tech entrepreneurship and innovation in this event. Although women constitute 52% of the total EU population, they represent only one third of the self-employed workforce and 30% of its start-up population. And here they constitute the majority of one person enterprises (78%). The areas of business that women prefer are health and social work activities, services and education. Female creativity and entrepreneurial potential are an under-exploited source of economic growth. The main challenges faced by female entrepreneurs are related to access to finance, access to information, access to business partnering networks as well as reconciling business obligations and family life. How to ensure a higher participation of women (entrepreneurs) in EU funding instruments? How to shape European research and innovation funding instruments to better integrate female entrepreneurs? The National Documentation Centre (EKT), as Horizon 2020 National Contact Point for a number of individual programmes (such as ERC), supports the Greek academic, research and business communities in their participation. It covers all stages of the research project, from preparation of a proposal to implementation and exploitation of research results. EKT’s services include: Information and Advisory Services, Helpdesk, Development and Handling of informational material, Organisation of events and seminars, Partner search for joint ventures and the publication of statistical data and performance indicators. EKT offers advanced technological infrastructure and long experience in European funding, Technology transfer and inn services. It is co-ordinator for Enterprise Europe Network-Hellas, the Greek node of the largest network providing integrated services for businesses so as to enhance their competitiveness based on knowledge and innovation. The Enterprise Europe Network is the largest support network in the world for SMEs with international ambitions, having 3,000 experts from 600 organisations in more than 60 countries.